Irish Water is writing to thousands of people living in Dublin this week to warn them that their water is supplied through lead pipes. Irish Water says that most people receiving these letters have a level of lead in their water which is above safe limits. So, if you get one of these letters how do you get your water tested? Irish Water is refusing to supply test kits or to test everyone’s water who asks. However the HSE’s Public Analyst Lab has told me that they will test water for lead for a fee of €10. What is recommended is to take 2 Samples from the cold tap in the kitchen: (i) the first sample is taken first thing in the morning after the water has been sitting in the pipes overnight; (ii) the second sample is taken after the water has been allowed to run for a few minutes (approximately equivalent to 2 sinks full or 20 litres). The ‘First Flush’ result will determine the extent to which lead is entering the water from any lead piping and the ‘Second Flush’ sample will determine whether allowing the water to run will flush out the lead and make the water fit for consumption. The samples can be taken in a ‘Ballygowan’ type bottle, rinsed out with the sample water the evening before. Alternatively, sample bottles can be collected from the laboratory in advance. The bottles do not need to be sterilised and at least 1 litre volume is required for the determination of lead. The samples can be dropped into the laboratory reception (at the address shown below) Mon-Fri 9am-5pm (except Bank Holidays) and the reception is closed on a Thurs & Fri 1-2.15pm. The total cost of the analysis is €10. No! Irish Water should not be allowed to charge for undrinkable water. If your meal was contaminated and inedible in a restaurant, you wouldn’t have to pay – so why should you be asked to pay for contaminated water? Irish Water has talked about the need for homeowners to change their internal lead piping – but what if the pipes supplying your home from Irish Water are made of lead? Irish Water has not indicated in the letters they sent out whether the problem lies on their side or on the homeowner’s side. Irish Water refused to supply me with the information about lead pipes in their supply network and I have now lodged a formal request under the Aarhus convention’s freedom of access to environmental information. How much would it cost to replace lead pipes in your home? It could cost from a few hundred to a few thousand to replace lead pipes in a home. Minister Alan Kelly announced in June that a grant would be provided to low income families to replace pipes. No more has been heard of that scheme since then. What if you are a tenant? 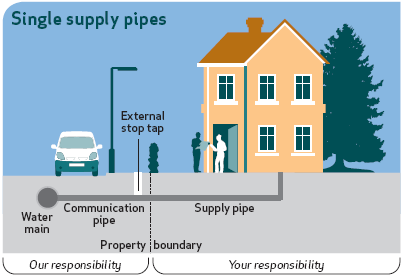 Irish Water recommends that you ask your landlord to replace the pipes. Obviously there is a near zero chance that your landlord would agree to this. Tenants have not been considered. A programme is needed to replace lead pipes in all rented properties and to phase this is so that it becomes a minimum standard when renting out a home in future. What are the health implications of lead in the water suppply? The HSE has published some informtion about the health effects of lead in water. Irish Water told me earlier this year that around 10% of homes they connected to meters are connected to lead pipes. Reading your article of 2015 on testing for lead in household water. Do you know if the testing for E10 in Public Analyst’s Lab. is still available? I would love to have our water tested as our pipes are not copper or plastic but some other type. We live in an apartment building and hence have no meter. Would it be possible to have our water tested please? Yes, you can test your water, whether or not you have a meter or live in a house or an apartment. Just follow the instructions on this page.